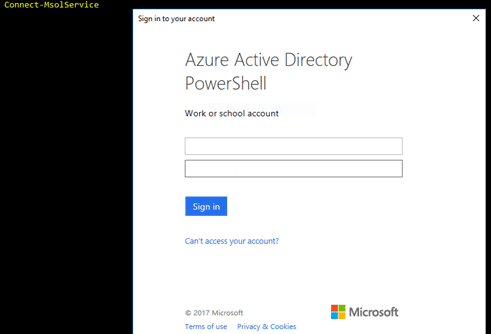 The Office 365 platform includes a PowerShell module that allows you to manage Office 365 organization settings, configure users and licenses from the Command prompt. As with Exchange, there are several things that you can’t simply perform from the GUI in Office 365. To connect to Office 365 from PoSh CLI, you need to install additional software. As a workstation, only 64 bit versions of Windows 10, 8.1, Windows 7 SP1 or Windows Server 2016/2012 R2 / 2012 / 2008R2 with .NET Framework version not lower than 3.5.1 can be used. Now you can connect to your Office 365 subscription in Azure Active Directory. 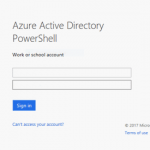 In the Azure Active Directory PowerShell window that appears enter the username (use full UPN – User principal name) and the password for Office 365, and enter the confirmation code from your phone. Note. Your account must be a member of the administrative role of Office 365. Upon completion of the command, a connection with your Office 365 tenant will be established. The cmdlet returns all SKUs belonging to the organization. You will receive detailed licensing information, find out how many licenses are available and how much is used. As you can see, the list indicates whether the license is assigned to the user or not. If you do not specify the -Password argument when creating a user, a random password will be generated and assigned for the user.